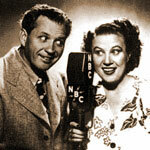 Fibber McGee & Molly was a highly popular, long-running comedy series broadcast from 1935 to 1959. It stood the test of time and the ebb and flow of American popular culture to become one of the most loved and important shows of the radio era. Jim and Marian Jordan played themselves as a fun-loving couple Fibber and Molly in this family situation comedy. As the Jordans were veteran performers in theater, there was music and songs interspersed throughout the show. The series centered around many challenges encountering the men and women in America during WWII, such as gas and meat rationing, buying bonds, and rubber conservation. Like Bob Hope, Fibber and Molly played their patriotic parts through their show. The series relied heavily on the couple's blunders, gags, and Irish homespun humor. McGee was portrayed as a good-hearted yet error-prone Everyman who's constantly in need to be set straight by his wife and his neighbors in their close-knit community. None of the show's many running gags was as memorable as "the Closet." McGee was frequently heard saying, "I gotta get that closet cleaned out one of these days . . . " Sure enough, one of these days never arrived. Indeed, Fibber McGee's "closet" has become synonymous with household clutter in American idioms.